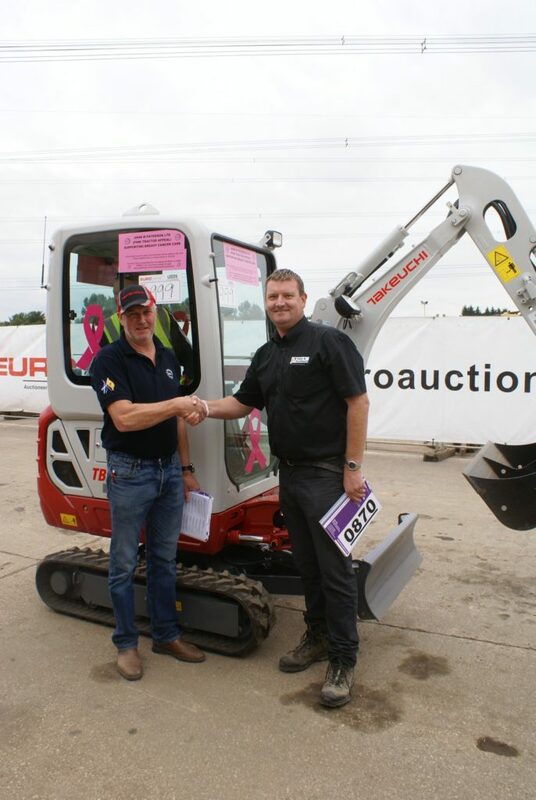 A new Takeuchi TB216 mini-excavator recently went under the hammer, raising over £30,000 for charity as part of Jock’s PINK Tractor appeal. The appeal is the brainchild of Jock Paterson and his wife Karen, of Ayrshire-based John M Paterson Plant and Machinery, who set up the campaign almost twelve months ago by purchasing their first Pink Tractor. Due to demand, they purchased a second and have donated 20% of all hire revenues to the campaign for Breast Cancer Care. The auction took place at a recent Euro Auction sale in Leeds. Jonny Keys, operations manager at the company explained, “Jock is a good customer of Euro Auctions and when he asked for our help it was a resounding yes from the team. We hoped this special lot would go for good money and considerably more than the ‘typical’ anticipated auction price, as all the money is going to an excellent cause. The successful buyer was Ian Burton of Cumbria-based dealer Taylor & Braithwaite, who last year embarked on a similar fundraising campaign for Cancer Research. Ian commented, “We all know someone with cancer and we are always looking over our shoulder, which is why we launched our own campaign last year. We had no charitable endeavour for 2018 and when we heard about Jock’s PINK Tractor it was the perfect opportunity to make a difference, so we attended the sale to see what was going on. Following the conclusion of the auction, the Euro team asked the crowd to raise its bidding numbers to donate £250 to the campaign, resulting in an extra £11,250 to the overall total. Jock Patterson added, “The initial aim for Jock’s PINK Tractor was to raise £10,000 in a year, which has been totally smashed. The total currently stands at a little over £70,000, which has left me speechless. I cannot believe the generosity of the Euro Auctions crowd, it was a humbling experience and I am still in a state of disbelief.